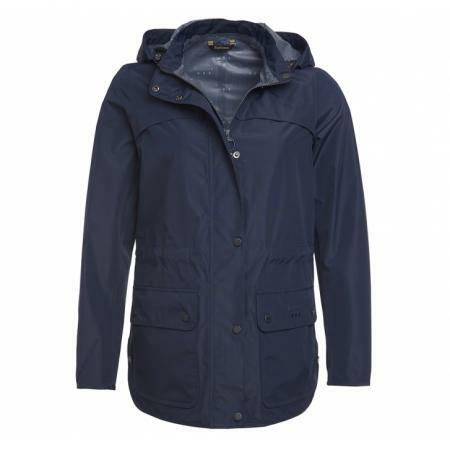 Barbour Ladies Barometer Waterproof Breathable Jacket in navy blue. The Barbour Barometer is a ladies' mid-length rain jacket with a waterproof and breathable outer, a detachable hood and an adjustable inner drawcord at the waist. A curved, studded side hem creates a flattering silhouette, while patch pockets add extra practicality for everyday wear. Finished with Barbour Weather Comfort embroidery and contrast matt trims. Wash separately and do not use fabric conditioner.SALE!